Christmas cactus has been a favorite houseplant. It’s not unusual for a single plant to be passed down from generation to generation because they’re long-lived, rather easy plants to grow. But if you want to get them in bloom for the upcoming holiday season, they will need a little special care during the coming weeks. Hybridization over the past century has resulted in the introduction of many new varieties of Thanksgiving, Christmas and Easter cactus. These plants are members of the Zygo-cactus family. Most of which are native to Central and South America. Although these plants are called cacti, they are truly different in all aspects from the common desert cactus with which we are all familiar. These plants, called epiphytes are found in the same environments as orchids. They are most often found in the forks of tree limbs where they grow in decayed leaves and other natural debris that accumulates there. Since they are tropical cacti, their cultural requirements are totally different from true cacti. So here are a few ideas on how to care for them and the steps to follow to get them into bloom for the upcoming holiday season. 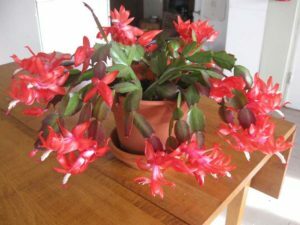 Since the Christmas cactus is a tropical plant it will require watering on much the same basis as any other type of tropical plant. A good procedure to follow is to water the plants thoroughly and then allow about the top inch of soil to dry before watering again. However, during the fall and winter months, the plants should be watered less frequently in order to get them to bloom. One of the most frustrating things that can happen to Christmas cactus is after the flower buds have developed they drop off the plant. Bud drop can be caused by anyone of several different conditions. Usually it’s because of over-watering, lack of humidity or insufficient light. After The Christmas holiday season, the Christmas cactus should be given about a 30 day rest. Again place it in a cool room and provide limited water. Don’t worry if it loses a few leaves or joints and appears weak during this rest period.